KALISPELL, Mont., Sept. 8, 2011 (SEND2PRESS NEWSWIRE) — Since its beginnings in summer 2009, Skull Church has delivered killer concerts from popular Christian artists and a clear gospel message to the Flathead Valley. Named for the place of Christ’s crucifixion, Skull Hill, the monthly event is regularly held at the Liberty and Strand Theatres in Kalispell. This month, for the first time, the event will be taken on the road for two days to the historic Wilma Theater in Missoula. 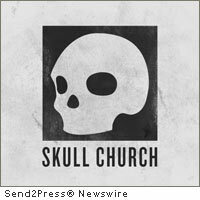 Fresh Life Church produces Skull Church events. Taking place Sept. 16 and 17, Skull Church Missoula will feature two highly anticipated bands, Blindside and Family Force 5, with the cornerstone of the night being a raw and relevant gospel message from Levi Lusko. Skull Church has become an impressive platform for live music, and the Missoula event will be no different. Attendees can expect state of the art audio and visual technology, along with an experience that rivals most mainstream concerts, but the focus isn’t the show. “The platform may be intense, the music and media aggressive, but the heart of the night is to lead the audience into a better understanding of who Jesus Christ is and what he did on the cross,” says Executive Pastor Coy Trammel. Although the edgy format and use of technology typically draws a younger generation, Skull Church is for everyone. “Skull Church isn’t your grandmother’s church, but she’s welcome too,” says Lusko. Doors open at 6:30 p.m. with the evening kicking off at 7:00 p.m. both nights. Skull Church Missoula is a free event specifically for a generation that does not know God, isn’t necessarily “into” church, and desperately needs Jesus. The primary focus of the night will be to bring a culturally applicable, explicit gospel message. For those who can’t make it, Skull Church Missoula will be broadcast online through a high definition webcast at www.skullchurch.com – and streamed live on Fresh Life Radio at www.freshliferadio.com . For more information about Skull Church, call Fresh Life Church at 406.257.3339. Skull Church is a ground-breaking, evangelistic monthly event centered on the gospel of Jesus Christ. Produced by Fresh Life Church and based in Kalispell, Montana, Skull Church was launched in June of 2009 and occurs on the first Wednesday of every month. Further information can be found at www.skullchurch.com . Original Keywords: gospel message from Levi Lusko, Skull Church Missoula, Executive Pastor Coy Trammel, Fresh Life Church, Kalispell, Montana, evangelistic monthly event centered on the gospel of Jesus Christ, Fresh Life Radio Fresh Life Church Kalispell Montana KALISPELL, Mont. REFERENCES: Entertainment News, gospel message from Levi Lusko, Skull Church Missoula, Executive Pastor Coy Trammel, Fresh Life Church, Kalispell, Montana, evangelistic monthly event centered on the gospel of Jesus Christ, Fresh Life Radio Fresh Life Church Kalispell Montana KALISPELL, Mont.